Can you believe I've never actually seen either of these before? I'd always been aware of them, but like so many 80's thrillers, I never took the time to actually watch them. I was more of an action and horror fan back then. Who am I kidding? I still am! But I have grown to really love the thriller genre as well lately, especially those from the 80's and early 90's, which is exactly where these two fall into. When I found VHS copies of these at my local thrift shop, it was just the sign I needed to finally do what has taken me 31 years to get around to. Let's dig in. This film is such an excellent example of a smart, classy and competeint thriller. I really didn't know what to expect going in, but do love Brian Dennehy, whom I've seen in a lot of stuff lately, and just the fact that it's made in and set in the 80's was a big selling point. 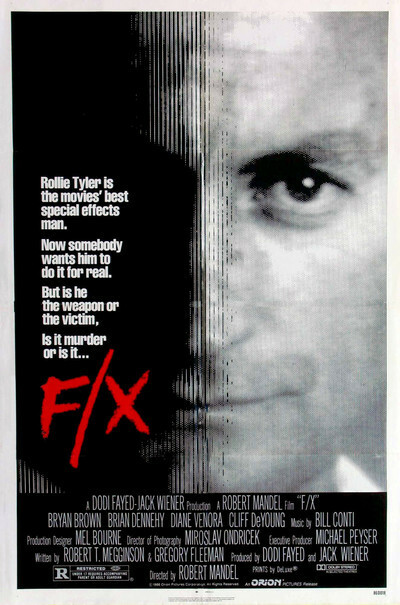 But then once the film started the full impact of how great this was hit me when I discovered that the premise centered around the fact that the main character of Rollie (Bryan Brown) is a master special effects technician in Hollywood. Boom! This just became 10 times more awesome. And better yet, they utilize that angle to it's fullest extent and I loved every second of it. Rollie is a world famous special effects master. When a government agency hires him to create an effect/illusion for a mob witness in a scheme to put him in a witness protection program, he's double-crossed by the very agency that hired him and he sets out to clear his name. Bryan Brown does a fantastic job in the lead. I don't think many people had heard of him outside of Australia at this point, and you have to assume that any big name actor could have played this part because it's not specific to an Australian by any means, but by casting Brown, who was big in Australia, F/X really elevates itself to a higher caliber. Brown adds his own spice to the mix, and sells it well. He plays Rollie like an arrogant, yet likable guy and really, that can be a hard thing to do to try and find the right balance. And he does it effortlessly. I think that the main thing that makes this so great is the movie f/x angle. Here you get to see him work his magic and it's a blast to see. It's even more fun and amusing when he uses his talents to trick the bad guys and clear his name. It's almost like he's a vigilante, using his movie effects mastery to always one-up the bad guys. I'm telling you, it's a lot of fun and such a creative way to progress the story along. If you're looking for a great 80's thriller full of thrills and ingenuity in a tired genre, this is the one for you. Solid craftmanship, great performances, and the special effects angle will surely win you over. Plus, you get to see a very young Tom Noonan as a henchman. It's ace. This one came 5 years after the original, and the story also utilizes that 5 year gap. One of the things that really got me excited about this one was that it was directed by Richard Franklin, who I've loved for his work as director on Psycho II, Cloak & Dagger, Road Games and the original Patrick. So unlike the first one, I really went into this one with some rather high expectations. Did it live up to them? Let's dig in. Rollie (Bryan Brown) and Leo (Brian Dennehy) have gone their separate ways since the events of the first film. Rollie has found a new love and stepson and has retired from the world of special effects. When his girlfriends ex-husband and father to his stepson, a cop, asks Rollie to help them catch a killer by using his effects skills, he reluctantly agrees, only to have the situation blow up in his face and he's once again running for his life and trying to protect the ones he loves. With the help of his old friend Leo, they set out to exact revenge. Yes. I mean, hell yes! I've been discussing these two films on both my Instagram and Facebook pages and this sequel really seems to split everyone down the middle. Some love it, or even like it more than the first, and others just feel it's unnecessary. I happen to agree with both, but at the same time, I absolutely loved it. Yes, there's nothing really in here that justifies a return after 5 years, but holy hell was it a blast from start to finish. There's just such a much more fun vibe this time around. We're already familiar with the characters by this point, and the ridiculous situations they find themselves, no matter how preposterous, always put a smile on my face. This guy is like McGuyver! This is the kind of film that I always look forward to, the sequel that ends up being better than the original. But you know, that's all a matter of taste. I just so happen to feel this went above and beyond where the first film went. While the original laid the groundwork for these characters and some of the situations, director Franklin and company dial it up several notches, sometimes into the absurd, but always in a very late 80's/early 90's kind of way, which makes it somehow tolerable. There's a very specific polish to it all, a slick sheen that goes for broke in the most audacious way. While the first film plays it straight, resulting in an efficient and compelling thriller, this one has more fun with it. 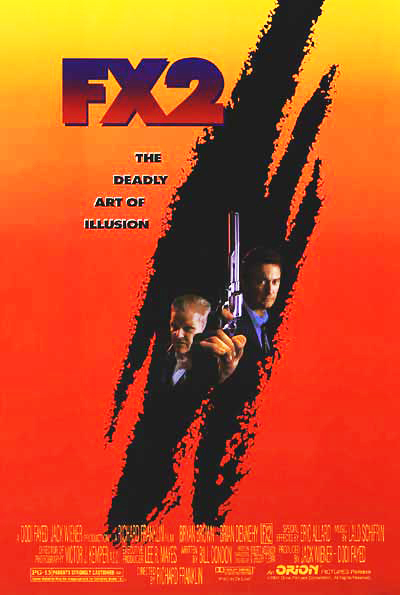 For me, it's like Lethal Weapon 1 and 2. The first one is dead serious and plays it straight, while the sequel, which also carries the serious tone for most of the time, also infuses more comedic and fun elements, even in the deadliest situations. That's how I feel about these two films and it's a formula that works. I said it before and I'll say it again. I loved this sequel. It had everything I hoped it would and then-some. Brown and Dennehy make such an exciting team I wish they had made more of these. Richard Franklin's direction propels this film higher than I could have hoped. Whether it's dealing with the action sequences, thrills, drama or momentary funny bits, he handles it all with class and style, and F/X 2 is a much better film because of it. I love both these movies. I think I saw the 2nd one first and it's always been my favourite. I like that there's more interplay between Brown and Dehenny and you've got to love the animatronic clown. I recently checked out the TV show they did in the late 90s. It's okay - a little like Mission Impossible - but it's never quite as cool as it should be. Strange - if you think about it - they'd never remake this film nowadays. No one uses practical effects much anymore.